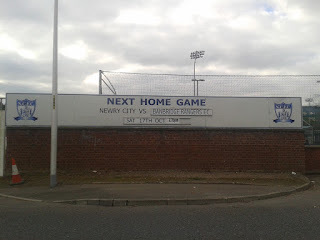 Not many football clubs had such an up-and-down existence as Northern Irish club Newry City FC, which was founded in 1918 (and entered senior football in 1923) and was dissolved in late 2012 having just failed to gain promotion to the then IFA Premiership. Out of the ashes of the old club came Newry City AFC, which was founded on 7/3/13 and joined the regional Mid-Ulster Football League at Intermediate B level. Their first season, 2013-14, was a success, whith the club gaining promotion to the Intermediate A division at the first time of asking. However, last season was one which did not go the club's way as they finished fifth in the fourth level of Northern Irish football. In direct contrast, the 2015-16 season has begun swimmingly for manager Darren Mullen's men with the team having won all of their first five matches to sit joint top with Banbridge Rangers, whom they hosted at Newry Showgrounds on 17/10/15. 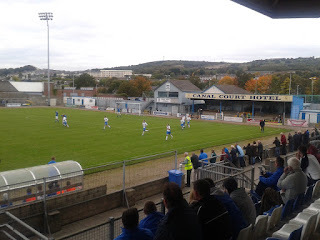 City were favourites to pick up the three points from this encounter and thus extend their winning run, but Banbridge Rangers kicked off and went straight into attacking mode, with Jonathon Porter embarking on a run down the right-hand side; Porter's dangerous cross almost reached Andy Mallon at the far end of the penalty-area, but City defender Thomas McCann cleared the ball at the second attempt. Mattie Dodds then had a long-range effort for the visitors which was charged down by Neil Mullen. This was followed on seven minutes by another run, this time from William Frazer down the left, and home defender Conor McCaul amost diverted Frazer's cross into his own net with goalkeeper Peter Murphy beaten, but to the relief of one and all in the City camp, the ball eventually went behind for a Rangers corner. From the corner, Rangers defender Chris Chambers climbed highest and headed the ball goalwards, only for McCann to head the ball off the line. Rangers had certainly dominated the first ten minutes with Porter looking sharp in the forward line, but Newry defenders McCaul and captain McMahon were proving resolute and their partnership was to prove a defining feature of the remaining eighty minutes. The following ten minutes were as forgettable as the first ten were exciting, but the signs were there that Newry City were finally upping their game. James Walker almost found a way through the Banbridge defence after twenty minutes when he was on the receiving end of a high ball from midfield, but after controlling the ball with his chest, he was tackled by Jeff Brady whose excellent tackle swept the ball away from immediate danger and out for a corner-kick. A corner five minutes later from Stephen McCabe caught everyone out as it travelled along the visitors' goal-line and came back off the post; it came to McCaul, but he lost his footing and the ball stuck between his legs as he lined himself up to shoot, and he scooped the ball wide. As the game reached the half-hour mark, alarm suddenly spread amongst the home support as a pass intended for Neil Mullen was woefully underhit and was intercepted by Porter, who spotted that Murphy was well off his line and lofted the ball over the stranded 'keeper from some 20 yards out. There was doubtless relief amongst the City faithful as the ball clipped the top of the crossbar and went behind for a goal-kick. Seconds later, Jeff Cousins received the ball on the left-hand side and he, too, attempted to chip Murphy, but his shot floated into the City 'keeper's hands. It was the first actual save that either goalkeeper had had to make, and that after 31 minutes. Murphy was also involved in another scare in defence shortly afterwards, when he dropped a cross just by the penalty-spot with two Rangers players in close proximity, but the ball, which had fallen behind him, was hurriedly cleared. In a somewhat bizarre turn of events going into the last five minutes of the first half, three Banbridge players went to ground within moments of each other, one with an injury, and the others with what seemed to be cramp. Fortunately, all three recovered and were fit to continue. It was just as well, as the home team upped the ante. McCabe was making some dangerous runs down the left, whilst McCaul got on the end of a good free-kick from the right which caused a scramble in the visitors' box, but Steven Teggart got back just in time to clear the ball. Walker cleverly hooked a ball over team-mate Decky Carville's shoulder with a minute left, but Carville only just failed to connect; in injury-time, McCann tried his luck with a shot from distance which was well blocked by Colin Chambers. It was scoreless at the break, but there were signs that Newry City had the beating of their visitors, but the final ball often didn't match the quality of the rest of the move, or was miscontrolled. At the back, Mc Mahon and McCaul were looking very comfortable indeed, whilst, going forward, Walker and McCabe both had an impressive first half. Banbridge Rangers, meanwhile - above all Porter and Mattie Dodds - had looked dangerous on the counter-attack. Scott Ward was leaving his mark - both literally and metaphorically - on the home side's midfield, but despite his scorched-earth policy, which was not always appreciated by Newry players and supporters alike, was head and shoulders above the rest of his team in the first half. 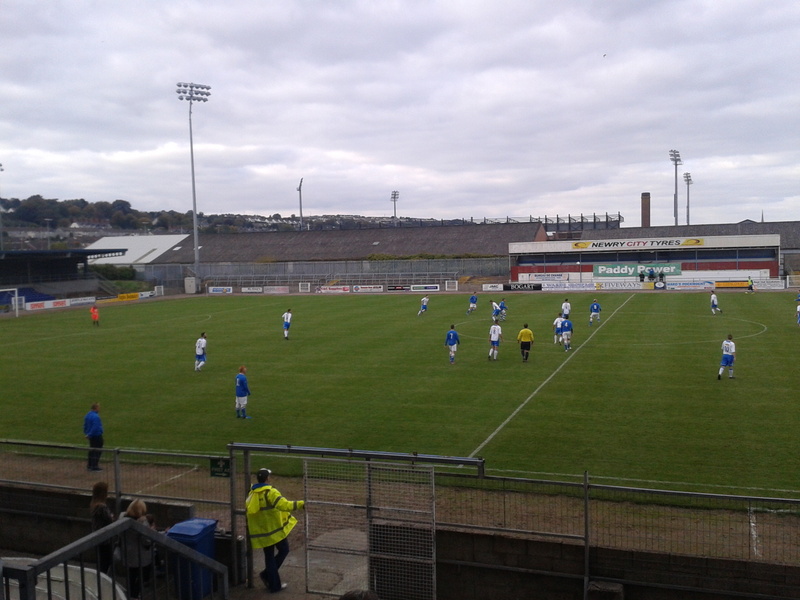 There was little to separate both sides in the first ten minutes of the second half, but there was the bizarre sight of the Banbridge linesman spending much of that time just inside the Newry City half, seemingly unnoticed by the referee. However, the match official eventually realised that he was in charge of a football match and finally wrote Scott Ward's name in his little black book; not for yet another haphazard challenge, but for dissent. Ward's team-mate Teggart broke up a promising move from City pairing McCabe and Seán McMullan inside his own penalty-area with a timely interception, and not long after, City were caught on the counter-attack by a ball through to Jeff Brady, who blazed his shot high and wide. James Walker and Decky Carville had crafted the makings of a chance for themselves just shy of the hour-mark, but the latter dallied slightly, just enough for Scott Ward to clear the Banbridge lines with a timely sliding-tackle on the edge of the away team's area. 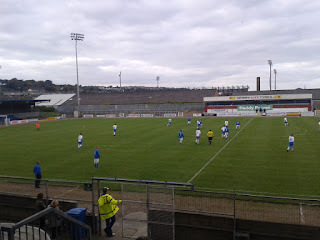 The referee made a decision on the hour which both baffled and incensed the home support in equal measure when he decided that McMullan, having been put clear of the Banbridge defence some 40 yards from Ivan Blevins' goal thanks to a through ball from one of his defenders, had strayed offside. An odd decision, indeed; McMullan not only appeared (at worst) level with the Rangers defence when the ball was played, but the referee was at least five seconds and twenty yards behind play when he called McMullan offside. The incident seemed to give City more impetus, and a high ball across the Banbridge area reached McCann, who miscued his volley; Chris Chambers chested the ball back to Blevins in the Banbridge goal, but he almost put the ball through his own goal only for Blevins to save at full stretch. With 62 minutes on the clock, this was the first serious save that either goalkeeper had to make, but more would follow. Five minutes later, after being on the end of a pass from the rampaging McCabe, McCann crossed into the Banbridge penalty-area, and his aerial pass was headed on by McMullan to Carville, who headed the ball goalwards eight yards out from the visitors' goal, and his header would have paid dividends only for an acrobatic save from Blevins, who clawed the ball away to his right. A spate of yellow cards then followed, with Brady being booked for fouling McCabe in the build-up to McMullan's effort, and Walker and Porter receiving theirs seconds later after a verbal tête-à-tête. With under twenty minutes left, Newry City fashioned another chance to put themselves in front: McCabe, with assistance from Chris McMahon, delivered a cross which found the head of McMullan, who in turn flicked the ball on to Carville, who was in splendid solitude ten yards from goal and who let go a stinging half-volley, but shot straight at Blevins. McMullan later headed over himself after a good ball in from Walker on the right. 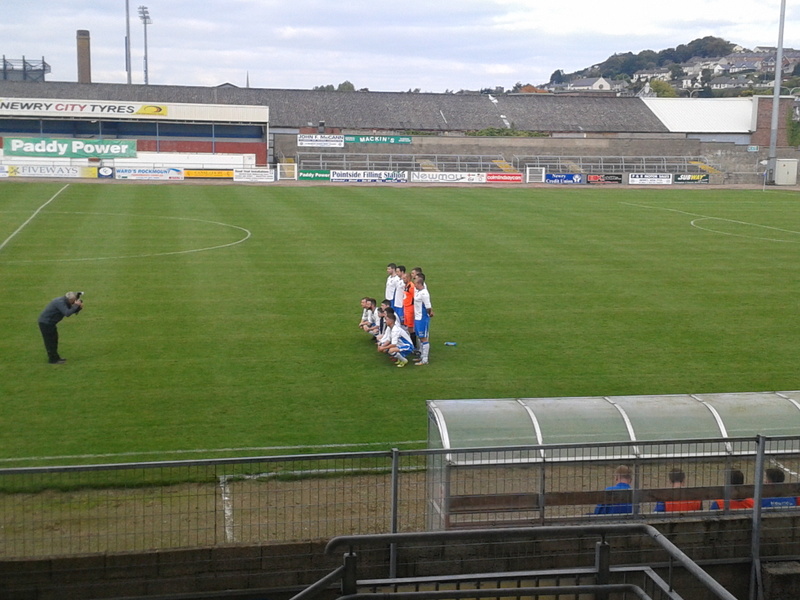 The home side were finding more and more space down the right, and almost broke the deadlock in the 80th minute after a quick interchange between McMullan and Timmy Grant at a corner-kick; Mc Mullan sent in a low cross which evaded everyone in the Banbridge defence, and the onrushing Decky Carville, who ghosted in and only just failed to connect with the ball as the away team stood ball-watching. Walker fired a volley high and wide after some head-tennis at the edge of the penalty-area; it was to prove his last significant contribution to the game as he was replaced with five minutes to go by Mark Lowry, who immediately took up residency on the right and sent in a couple of decent crosses within moments of entering the fray. Banbridge were by this stage grimly holding on, but hopes of heading home with a clean-sheet were dashed in the 80th minute, when Niall Crilly raced up the right, as he had been doing for much of the game, breezed past substitute Danny McKinstry and slung in a low cross which bounced before sitting up nicely for Timmy Grant at the far side of the area, who stroked the ball home from five yards, to the frustration of the Rangers and their sizeable contingent of fans, but to the joy and relief of the home support. Newry City defended en masse as Rangers threw everything at them in injury-time, but the closest the visitors came to scoring was via Chris Chambers' late effort which was deflected behind for a corner, and the home side were able to celebrate a hard-fought victory which moved them three points clear at the top of the Mid-Ulster League Intermediate A Division and a step closer to Irish League status. POSTSCRIPT: Newry City's unbeaten run in the Mid-Ulster League Intermediate A continues; after winning eight and drawing one of their nine league matches so far this season, they currently sit top of the table with 25 points and a six-point cushion on nearest rivals Valley Rangers and Hanover. Taking all competitions into account, Newry City have lost just once so far this season, suffering a 2:1 defeat against Crumlin Star in the second round of the Irish Cup back in October. Newry City's most recent fixture took place on 5/12/15, when they took on Camlough Rovers in the semi-final of the Premier Cup and won 2:0. 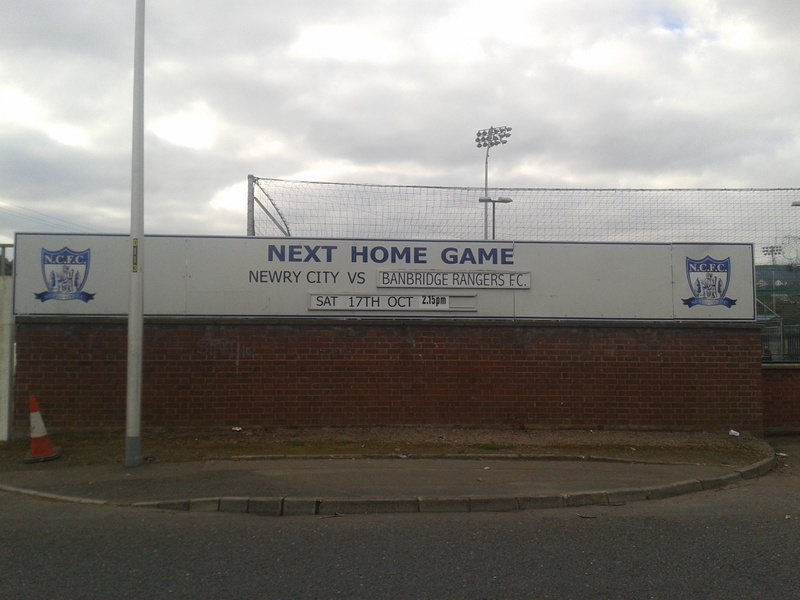 (City defeated Banbridge Rangers in their return league fixture a week earlier by 5 goals to 3.) The club's supporters now have a cup final on 28/12/15 to look forward to, when they take on Fivemiletown United, currently in eleventh place in Intermediate A, in the final of the Premier Cup. The game is scheduled to take place at Crystal Park, home of NIFL Championship 2 side Banbridge Town with an 11:30 kick-off. AUTHOR'S NOTE: Due to the occasionally forgetful nature of your correspondent, the above report is more than a little late in being written; many thanks to Laura and Gerry Hillen for rescuing the situation; thanks, too, to Gary Wilson, Jim Campbell and all at Newry City AFC. 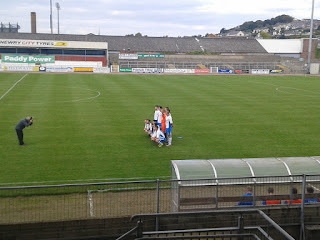 There will be more on the club's travails in due course, and a history of sorts on Newry Town/Newry City.